I am an emerging artist who is exploring felt and botanical printing. My goal as a new artist is to make practical and elegant wearable art. I want to create pieces that people feel comfortable wearing everyday yet are both beautiful and unique. My Nuno scarves and shawls are felted on to silk fabric using blends of wool with silk that give them a sheen that is not possible with merino wool alone. My lacy Cobweb felted scarves are made with a variety of premium wools in beautiful hand dyed colors. I support other Pacific Northwest artist and small farms by purchasing my fiber from them. 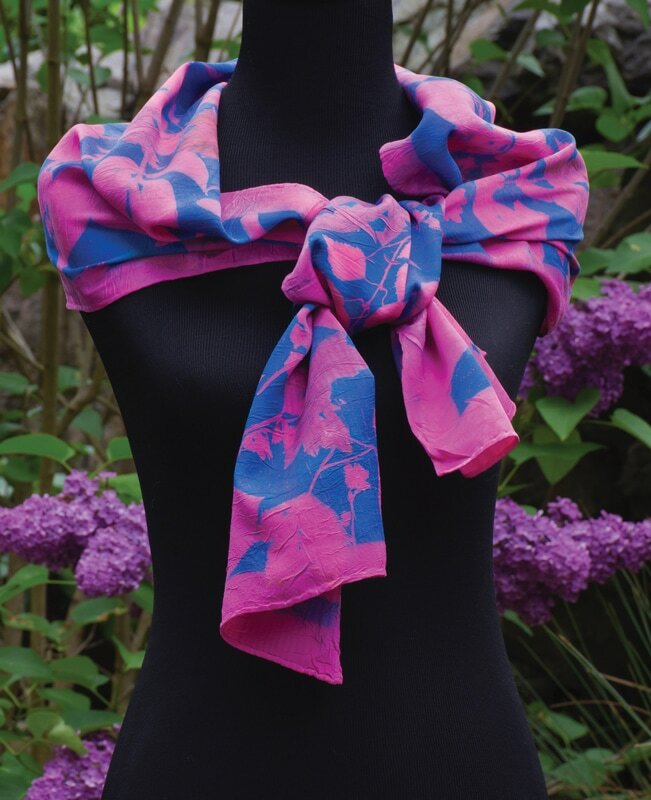 In my botanical printed scarves I use local plant materials, lichens and natural dyes to print lovely images on natural fabrics. As a survivor of ovarian cancer, I donate 10% of my profits to the Fred Hutchinson Cancer Research Center in Seattle. I feel fortunate to be alive, to be an emerging artist and to be able to make beautiful accessories. DIRECTIONS: Follow Hwy 525 to Freeland. At the Freeland E Main St signal turn east and travel past the Rite Aid and Payless stores. At the first stop sign turn left onto East Harbor Rd. Drive 3.5 miles to Beverly Beach Rd. Turn left and go down the hill until you reach Basswood Rd, the first street on the right. Turn right onto Basswood Rd. The studio is the first driveway on the right at 4265 Basswood Rd.